Posts categorized "Monthly Clubs by Download"
Ready to join an online club with lots of benefits? Let's learn together! I love learning new things! Whether it's a great new layout, a scrumptious color combo, a brand new technique or just a way to use a stamp set that I never would have dreamed of, stampers are always learning. We often stick with this hobby for life, simply because it's never tired or boring. With that in mind, I've created a budget-friendly way for us to learn together, in a club-style format, but without the drawbacks and hassles. Just the fun, and a lot of value for your buck! What Does Lyssa Prepare Each Month for Class of the Month Club Members? What Do Class of the Month Club Members Have to Do Each Month? What Are Your Class of the Month Club Rewards? Every participant also gets their own main catalog and mini catalog, as well as Free Product Samples of the Month inside a handmade thank-you card in the mail. The surprise sample could be ribbon... embellishments... papers... you never know! You will really enjoy getting these large, useable samples. Try the freebie out--and if you like it, put it on your club order next month! My first new catalog order arrived!! I unpacked it all and the first thing I played with was the Decorative Ribbon Border punch. It makes such a pretty, lacy border, I love it! I used it here with the new ombre Color Theory papers in Berry Burst, a brand new In Color. These cards are the thank you notes for my Class of the Month club members! Everyone who purchases at least $30.00 (this months Suggested Order or the dollar equivalent) using the code 2PVWA2GP during June 2017 is getting a variation on this handmade "Lyssa Original" card and the free sample of the month, along with their club project PDF files. 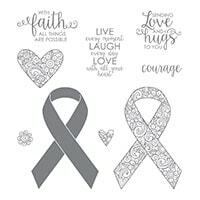 The featured stamp set this month is Ribbon of Courage, and the proceeds from all sales with this code will benefit Honor Flight of Wisconsin! Badger Honor Flight is my demonstrator team's community service project and we LOVE helping veterans enjoy a once-in-a-lifetime trip to Washington, D.C. to be honored and appreciated. It's a fantastic cause, and a fun bunch of projects this month, so why not use the code when you order, and get the free six-page, full color instructions and measurements file for six professionally-designed layouts? Courage Cling-Mount Bundle Save 10%! Not interested in the stamp set? Just order something else you need or want, instead, totaling at least $30.00. No worries! As long as you use the special code for the month, you'll receive a point for participating in COTM Club, and when you've saved up five points, you get a SHOPPING SPREE! Every month you also receive a handmade thank you card that includes another idea for the featured set--plus a generous sample of some new product for you to play with. Complete details on COTM club are here. I'm so excited so many of you are loving this "no commitment, just convenience" online club option as a way to expand your stamping skills and get the most bang for your crafty buck. May 2017 Class of the Month Code is here! I'm so excited to announce a new round of Song of My Heart's new "no commitment" club, Class of the Month! All seven of the projects created for you this month use Eastern Palace, a sneak-peek bundle now available from the upcoming catalog and our adorable featured stamp set for May 2017. I've been so taken with this stamp set, which I was convinced was NOT my style--but wow, for someone who thought she didn't like it, I've sure managed to come up with a bunch of cards I really love, using Eastern Palace! I hope you'll play along with our fun new online club whenever you can--and remember, every fifth time you participate, you get a $30 shopping spree and I pay the shipping! Read all the details about the club and how it works here. The May code is: TUAUDWT6. IMPORTANT: Please note that during the month of May, Eastern Palace is only available as part of two different sneak peek bundles. See them here! Short on cash? Remember, you only have to order the Suggested Club Order Amount of $35.60, using the club code, to participate. You'll be able to get the Eastern Palace set by itself and all the other items in these bundles individually when the NEW catalog begins on June 1st. Ready to participate? The May 2017 COTM Code is TUAUDWT6. Place your order of at least $35.50 (before shipping and tax) at www.bit.ly/shopwithLyssa no later than May 25th, and the project files will be emailed to you within 24 hours. You'll also be receiving a hand-stamped thank you card from me, with the FREE Product Sample of the Month inside, something new and fun to try! Last chance to get March's Class of the Month! Are you one of my VIP Club members? It's the final chance to join Song of My Heart's new "no commitment" club, Class of the Month, for March 2017!! All seven of the projects created for you this month use Weather Together, our adorable new featured stamp set. The deadline is the 25th of each month. See the March sneak peeks above! These are just three of the six projects featured in this month's COTM Club PDF. I love this versatile umbrella themed stamp set all sorts of different occasions, and you will, too! Please note: the Weather Together stamp set has a matching Framelit collection called Umbrella Weather, but it is not necessary to have it if you don't mind a little hand-cutting now and again. Psst... remember you will get a free Sale-A-Bration reward choice when your order hits $50! Ready to participate? The March 2017 COTM Code is NAZT3DEE. Place your order of at least $30.00 (before shipping and tax) at www.bit.ly/shopwithLyssa no later than March 25th, and the PDF will be emailed to you within 24 hours. You'll also be receiving a hand-stamped thank you card from me, with the FREE Product Sample of the Month inside, something new and fun to try! I'm so excited to share my new adventure with you--the Class of the Month Club! It's the most flexible online club option out there. I'm so SURE you're going to love it, that I'm not even requiring a commitment to "lock you in." The club code will be published by the first, and your Suggested Order (or dollar equivalent of other products) must be placed by the 25th of the month. You'll be able to see what's on sale for the month and adjust your personal order to get what YOU want to add to your tools and supplies. The total will vary slightly each month depending on the stamp set, but will always be about $30-35. Your club order will need to be at least that for the month, before shipping and taxes. February 2017 Class of the Month Club: final days to get the free PDF! Nailed it is the Class of the Month for February 2017, so this card and five other ideas complete with detailed instructions and full measurements are available in a collectible full-color PDF file just for placing the Suggested Order (or the dollar equivalent) of $31 before shipping and tax. I hope you'll Shop with Lyssa using the code for the month-- TGMAT99R --and enjoy the free project PDF, emailed to you within 24 hours. The Product Sample of the Month, generously-sized and immediately useable, will be mailed to you with a handmade thank you card that also gives you another great sample of the featured stamp set. I have put a TON of thought into making this the best online club on the internet! Everything's going to work together to give you an amazing creative BOOST every month you participate! Learn cool tips like how to turn the Enamel Shapes into custom screw-heads for this adorable cartoon tools card. If you're ready for the full details on the Class of the Month Club (formerly titled Stamp Set of the Month Club) just click here to read the details. Happy to answer any questions about this revolutionary "no commitment" club from Song of My Heart! Participate on YOUR terms, when YOU have the funds, and at YOUR convenience. If you already have a Stampin' Up demonstrator who is not me : ) you can change your demonstrator for one order only, if you prefer. That will allow you to shop online for club and then any other orders revert to your local demonstrator. Hope to be sending YOU a "welcome to the club" packet, very soon! Make this card and five others with the Class of the Month! So, have you given Class of the Month Club a shot yet? You really should! There's so many reasons to--just a affordable $30-35 Suggested Order once a month, a six-page full-color PDF chuck-full of projects, complete instructions and measurements, free Product Sample of the Month, and a shopping spree every fifth time you participate. You'll love being a part of this exclusive, spoiled VIP shopper group! Full details available here. This card and five others are the stars of the show using the February 2017 featured stamp set, Nailed It. Great for guy cards, handyman thank-yous, Father's Day and birthdays, Nailed It can be pulled together in zillions of different fun combinations. Use it with the coordinating Build It Framelits or alone (ideas for both included). And it coordinates with the entire Urban Underground suite in the Spring 2017 Occasions Catalog, plus the Hardwood Background stamp, the Woodgrain embossing folder, and so much more. I hope you'll Shop with Lyssa using the club code for the month-- TGMAT99R --making sure your order totals at least $31 before shipping and tax--and enjoy the free project PDF, emailed to you within 24 hours. The Product Sample of the Month, generously-sized and immediately useable, will be mailed to you with a handmade thank you card that also gives you another sample of the Nailed It stamp set. Everything's going to work together to give you an amazing creative BOOST every month you participate! If you have any questions, please ask! Lyssa@songofmyheartstampers.com is the best way to reach me, or leave a comment below. Looking forward to seeing your name on my VIP club member list, very soon! January 2017 Class of the Month Club: final day to get the free PDF! It's the 20th of the month and the final day to submit your club orders to get the free featured stamp set project PDF and Free Product Sample of the Month! Plus a point towards the shopping spree you'll get when you accumulate five points! Click here for the full details on how my online club works. You'll LOVE how simple and quick it is to get your order AND four complete projects plus two bonus designs, every month! The Suggested Order changes every month but will always be between $30-40 dollars, depending on the featured stamp set. You do NOT have to order the Suggested Order! You can order the same dollar amount and it will still count as long as you use the club CODE for the month. The Class of the Month Club Code for January 2017 is 6KEGEE46. Some are having trouble spotting where to input the code--it IS is a little tricky in that it has to be put in before you hit checkout. There is no where to enter it during the actual checkout process. This photo will help you spot where the box is hiding! If you already have a Stampin' Up demonstrator who is not me : ) you can change your demonstrator for one order only, if you prefer. That will allow you to shop for club and then any other orders revert to your chosen demonstrator. I'm totally ok with that and in fact would encourage you to be loyal to your local demonstrator as long as she/he is providing you with great customer service and fun projects. We're all stampin' sisters and we know crafters get their inspiration--and their products--from a wide variety of sources, these days. Hope to be sending YOU a "welcome to the club" packet, very soon! Get this project and five others free with January's Club Code! High Tide (featured club stamp set for the month) is now available to order! I've been waiting so long to share the January 2017 Class of the Month Club sneak peek projects! It was so hard to pick just a couple of them to share--but the others are exclusive for club participants! Read how you can become one here. The SUPER cool thing about Class of the Month Club (other than all the freebies and the shopping spree every fifth time you participate!) is that all of the projects center around one versatile stamp set. I loooove buying new stamps as much as anyone... but I do have a craft budget and I want to make wise purchasing decisions. I need my stamps to work as hard as I do--and be flexible to fit all sorts of occasions. I know you come to Song of My Heart for the same reasons--real-life papercrafting tips and tricks for busy modern stampers. I think that's why COTM club--my take on the online ordering options out there-- has already caught the imagination of so many crafters. High Tide is an awesome choice for this month! I've already made six more different cards than the ones I'm sharing exclusively in the club PDF files. Because I'm terrible at keeping secrets... here's another fun layout! and get the amazing full-color, six-page PDF project files totally free! I'm so positive you're going to love this new club format that I'm not even requiring a commitment! It's as easy as shopping with the club code once a month, and reaping the monthly rewards and shopping spree every fifth time. If you have any questions, be sure to email me at Lyssa@songofmyheartstampers.com. I'd love to hear from you!